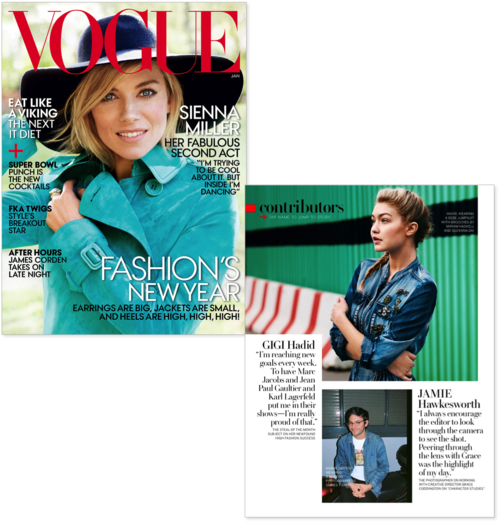 We are swooning over the Suzanna Dai Marseilles Brooch feature in the January 2015 issue of Vogue Magazine. Our medallion-shaped brooch is made of glass teardrop and diamond-shaped gems, and is available in Navy or Plum. You can style it in a variety of ways – add one to a messy bun to top off your look, dress up a cross-body with a touch of sparkle, or layer it on a denim vest for unexpected glamour (such as the look on Gigi Hadid shown above).